Danielle Eubank, "Mozambique II," 2016, oil on canvas, 5 x 5"
Travel, the saying goes, is broadening. Playfully letting the Metroline expansion, now inclusive of that Bergamot Station compound which the host gallery calls home, become a conceptual muse, this exhibition presents the work of four artists who roam. Danielle Eubank wants to paint all of the major bodies of water in the world. So far she has immortalized the colors and surfaces of water in Europe, the Middle East, Africa, North America and Asia as well as all the oceans of the world but one. Her singular focus on the waters of the world transforms these remote places into a rhythmic unity of delightful ripples and undulating patterns. It’s a visual abstraction that lifts the places she’s painted out of a been-there, looked-like-that travelogue, into something immediately more personal and identifiable. So it comes as something of a small shock to read a title like “Mozambique” when the painting’s water seems as familiar as our last trip to a local lake or pier. 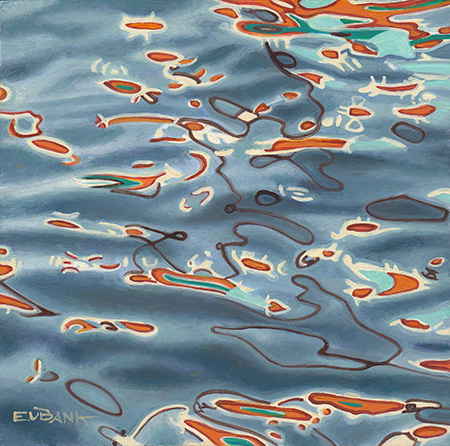 From a distance Eubank’s images have an almost photorealistic, slippery liquidity that is startling. But up close they surprise with their precisely painted organic shapes and the unexpected flatness of the oil paint itself. That contradiction between the slick, moving wetness of the image and the fixed stability of the painting’s construction reminds us that the artist wants to do more than document. She is creating an encounter with a physical presence and place, one that can indeed be represented, but is still not present. Photographer Tatiana Botton has traveled widely, photographing and writing for publications like Vogue and GQ in Europe and the U.S. For this exhibit we see her deep love of abstracted landscape in the sensual, undulant volume of cresting, silk-smooth grey sand dunes and the blue jigsaw of a fractured, floating ice field disappearing into a snow storm. In all these images Botton crops tightly. Images like “Nambia” and “Dunes” are a pristine arrangement of pattern and repetition. Shapes are drawn by deep shadow and plays of light. The result is a pure kind of visual texture that makes you wonder, like fresh snow on a field, what mark one footstep would create, or how many footfalls have already been erased by wind and time. If Botton’s images seem perched precariously at the single moment when shadows and light can precisely carve land into organic shapes, the photographs of Susie Loucks are quite literally all motion. And it’s time, rather than distance traveled that sets her images apart in this show. Setting up her camera at a local beach, Loucks takes long exposure photographs with her lens aimed straight out at the horizon. Over time the heave of the ocean’s surf, the crumbling crash of the waves and the changing color of the sand smear into horizontal linear abstractions. Long exposure makes each element lose its singularity. Sky, water and sand each become long, smooth horizontal lines or wide bands of tone and color. It’s a repetitive transformation, but often arresting. “End” is suggestive of a minimalist sunset landscape — all horizontally stacked radiant orange and luminous blues. “Day In” is a silky accumulation of wavering blue bands with a white core and narrow brown lines that seem to breathe. Painter Gay Summer Rick walks the streets and Metro platforms of Los Angeles, but for her it’s always an ephemeral, impressionistic territory of changing color and light. Rick gives us our urban landscape actively dissolving into pure atmosphere. Using rich, bright stains punctuated with thicker paint from pallet knife slashes of contrasting colors she deftly sketches out power lines and street signs, bridges and palm trees that resolve out of thin air. There is a haunting edge to all the insubstantiality. Like the smog that generates all those gorgeous orange sunsets L.A. is famous for, something lurks like a caution within those rosy sunsets and dawns, eating away at those power lines.